In 2016, approximately 1,685,210 new cases of cancer will be diagnosed in the United States alone, and approximately 600,000 people will die from the disease. The number of new cancer cases is 454.8 per 100,000 men and women per year, based on cases from 2008-2010. In a time where so much information is coming to light, challenging the belief systems of so many, it’s important to keep an open mind to new information to help us see through what’s really been happening on our planet. It’s no secret that a small group of corporations dominate almost every aspect of our lives, from energy to education, all the way to modern day healthcare. 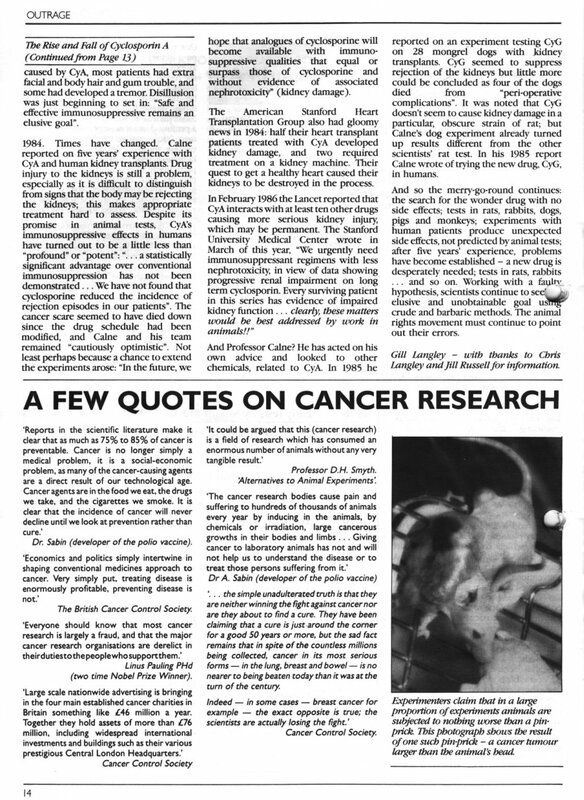 One aspect of healthcare is the cancer industry, and while people still scoff at the idea that there could be a suppression of cures and a lack of funding for proven alternative treatments, this is a fact that continues to come to light and is necessary for people to acknowledge if we are going to move forward and save millions of lives. Pauling’s ‘anger’ with regards to cancer research is well documented, especially in his book, How To Live Longer and Feel Better. These few quotes won’t tell you everything about what is going on, but the documentary below will. It’s a 2 hour segment from the film, The Truth About Cancer. The segment below features interviews with renowned health professionals from around the world, so you can hear it directly from the horses mouth. Most health professionals who are skeptical of the information below, often haven’t done the research for themselves to stay updated with what is going on. Real medical education goes well beyond medical school. As illustrated in the video below, medical school is largely a brainwashing tool for pharmaceutical medicines. This is becoming more evident as information keeps emerging that the average health professional has no idea about. We got, hours and hours and hours on how to use, basically patented medicines, which as you know, are what usually goes on a prescription pad as a molecule that can be patented which means that it’s not found in nature….And that’s what we get educated in. The doctor is brainwashed when he/she gets out of medical school because the medical school has too much subsidization of the professors who are being paid by the drug company, so the professor never teachers any student in medical school, why don’t you try vitamin C, they’re going to tell them the latest drug. Unfortunately, doctors today are simply taught how to prescribe drugs. Although their knowledge of the human body and how it operates is fairly good, and they often have the best intentions at heart, they are often being used to push an agenda, and it’s one of the primary causes for the rise of disease in the past few decades. In fact, medical error is now the third leading cause of death in the US. Doctors get paid to write prescriptions. Over a century ago, the Carnegie and Rockefeller foundations started to engineer the curriculum. They put their money into drug-based research and made that the main focus of “healthcare”. Since then, the Rockefeller’s and banking elite have been able to control and profit from the drug industry. The AMA – which is the largest association of physicians in the U.S. – enforces the drug-treatment paradigm by heavily lobbying Congress and publishing one of the most influential journals, JAMA, which is largely funded by pharmaceutical advertisers. It is also engaged in suppressing alternative health treatments, such as the Royal Rife cancer cure. There is a problem that’s well known in the medical community, which is why John Ioannidis, an epidemiologist at Stanford University School of Medicine published the most widely accessed article in the history of the Public Library of Science (PLoS) entitled Why Most Published Research Findings Are False. In the report, he stated that most current published research findings are false. Check out the Truth About Cancer series for more. It’s hard to believe that approximately one in every two people will develop some form of cancer within their lifetime. As a result, cancer awareness has skyrocketed. Millions of people around the globe are helping to raise money and awareness for cancer and cancer treatment. This overwhelming support from the public just goes to show how many good hearts are out there, and in no way should we dismiss that generous spirit. There are, however, some important facts relating to this disease about which many people are still unaware. While it is of course disturbing that cancer rates are at all time time high, the prevalence of this disease is causing people to take notice and to question, which is always a good thing. People are becoming more aware of the disease, looking into alternative treatment options and trying to determine the cause of this illness. People are starting to wonder why so many of us are so sick. So despite how gloomy it may appear, there is hope for all of us. The 5 facts about cancer below are indeed disturbing, but what’s even more disturbing is the fact hat nobody even talks about them. If we want to get to the root of this disease, ignorance is not the answer. Hopefully this article helps you learn some important information about cancer that you probably won’t hear much about in the mainstream. He is considered one of the most important scientists in history. He is one of the founders of quantum chemistry and molecular biology, and was also a well known peace activist. He was invited to be in charge of the Chemistry Division of the Manhattan Project, but refused. He has also done a lot of work on military applications, and has pretty much done and seen it all in the scientific field, so his words are not to be taken lightly. A growing trend amongst people who have been diagnosed with cancer is to seek out alternative treatment, and this is largely because so many people have reported solid success rates. We can also attribute this shift to the vast amount of published scientific literature pointing people in this direction. For example, here is a quick video clip of Dr. Christina Sanchez, a molecular biologist who explains the power of THC. Other ingredients within cannabis have also been shown to annihilate cancer tumours.Here is an older article with just a few out of hundreds of studies sourced, just to give you an idea. It’s worrying that no human clinical trials have been conducted on the use of cannabis to treat cancer, despite the fact that scientists have known for decades that it is effective. Mykala Comstock is a wonderful example of cannabis’ efficacy; she had T-cell acute lymphoblastic leukaemia, a very rare and aggressive form of childhood leukaemia. In July of 2012, doctors discovered a basketball-sized mass of lymphoblasts in her chest. Her mass was so large that she was not able to be sedated for risk of death from the pressure on her esophagus and heart. Yet only recently did the World Health Organization admit that glyphosate, the most active ingredient in Monsanto’s Roundup herbicide, can cause cancer. (source) A number of countries around the world have also banned glyphosate. Sri Lanka, for example, decided to completely ban itafter their scientists discovered that it was linked to chronic kidney disease. (source)(source) It has also been completely banned in various countries across Europe. Cynthia Curl, an assistant professor in the School of Allied Health Sciences Department of Community and Environmental Health at Boise State University, recently published a pesticide exposure study in the journal Environmental Health Perspectives. Results of her research indicated that among individuals eating similar amounts of vegetables and fruits, the ones who reported eating organic produce had significantly lower OP pesticide exposure than those who normally consume conventionally grown produce. These studies are important because the pesticides sprayed on our food are also very toxic and have been linked to a number of diseases, like cancer. Why are we consuming chemicals that were used to kill people in warfare? How can we possibly justify such irresponsible behaviour? And the problem extends further than simply what is being put on our food. Our food itself has been genetically modified by biotech companies, to the point where it bears little resemblance to its natural form, and is equally unrecognizable by our bodies. These companies incorporate genes from one species into a completely unrelated species. (source) This, according to many, is bad science. These examples barely even scratch the surface of carcinogens we are exposed to. Cosmetics, flame retardants, everyday household products — these are all a concern. It’s not a mystery why cancer rates are so high, but we never really talk about the issue in this way. Waster fluoridation is another example. Fluoride was recently categorized officially as a neurotoxin. So what can you do? Stop buying household cleaning products with toxic, carcinogenic chemicals. Do your research, ask around. Stop eating foods that are sprayed with pesticides, or at least properly soak and clean your fruits and vegetables for a decent amount of time before consuming them. Indeed, eat more fruits and vegetables to begin with. Exercise more, engage in activities/experiences that make you feel good and bring you joy — these are all simple steps we can take to show our bodies the love they deserve.